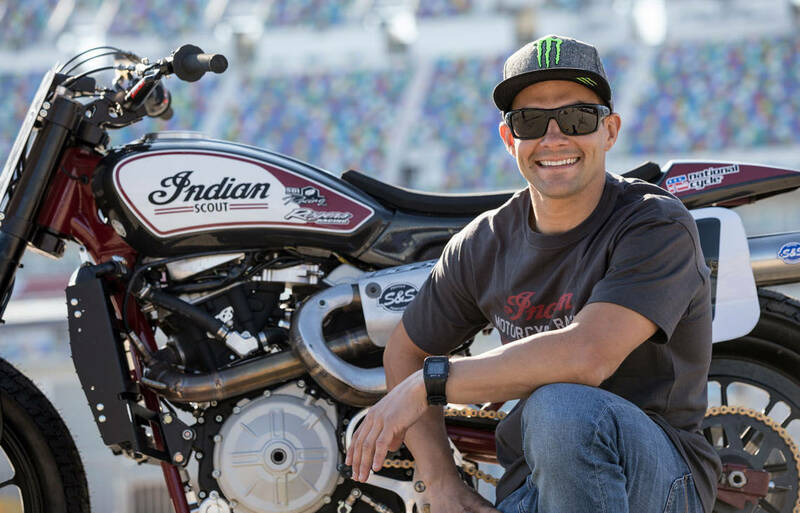 MINNEAPOLIS After more than 60 years away from professional flat track racing, Indian Motorcycle has won the 2017 American Flat Track Championship after Jared Mees’ first-place finish at the Williams Grove Half-Mile. The 2017 title marks Mees’ fourth career national championship. Although it looked like it was going to be Mees’ day to shine after he won both his Heat, Semi, and left everyone in his dust during the Main, multiple red flags threw some uncertainty into the mix. And even after his teammate and championship rival Bryan Smith crashed out of the race – pretty much sealing the deal on the championship with Mees only needing four points – Mees didn’t go easy. He held on to the win and crossed the line 0.232 seconds ahead of teammate Brad Baker. American Flat Track recognizes a Rider Championship in each class. The rider that accumulates the most points in each class over the course of a season is declared the National Champion of the class. With only two races remaining, and Mees (342 points) ahead of the next racer – teammate Bryan Smith – by more than 50 points, Mees has guaranteed a Ride Championship. Aboard the Scout FTR750, the Indian Wrecking Crew has combined for 35 of the season’s 48 total podiums, including six sweeps. Mees has nine victories on the season. Fellow Wrecking Crew Riders, Bryan Smith (276 points) and Brad Baker (247 points) will battle through the final two races of the season for second place. Indian Motorcycle Racing, backed by Allstate Insurance, has its sights set on inching closer to a season sweep as American Flat Track returns to the Lone Star Half-Mile on September 23. How have the manufacturers fared in Portugal? I also hope Indian Motorcycle can expand the range into other segments, but here is the problem. America says build it and we will buy, and that consumer base shrivels away to nothing when the product arrives. Example the current Honda CB 1100 everyone waited for the rebirth of the 1969 CB 750 with more engine, it arrived and it is beautiful yet no sales crowds gathered. Honda GB 500 same fate, the Turbo era motorcycles blew through in short order. Simply put the general motorcycle consumer base knows how to ask but either can’t pony up the cash or are spoiled. The mountains of motorcycles warehoused for years because consumers begged for it and then they collect dust. So for a company like Indian who has to consider the erosion of customer base to retirement age and fewer than ever new riders it would make sense to wander too far from home. Harley learned this with the XR1200X and they learned it with Buell. Ironically Buell learned it with EBR the American sportbike that nobody bought, just where did those eager cash in hand motorcyclists disappear to? Market in North America will continue to shrink. Can you tell me where the mountains of motorcycles in warehouses are please? They might be willing to give me a deal if I take two or three off their hands. Maybe not mountains, but they have a few 3 year old Honda models. They had the blacked out CB1100 for $5999. All gone now. Cheap 800 Interceptors and Valkyries. I think the problem is that manufacturers miss the mark. CB1100? An excellent motorcycle, but not at all built in the spirit of the CB750. GB500? Beautiful, but barely fast enough to get out of it’s own way. Turbos? They didn’t live up to the hype. Not even close. What else would you expect to happen? XR1200X? People were clamoring for a street tracker, not a 600 lb design train wreck. Buell? Let’s just not even go there. EBR? A good bike competing at a premium price against more established, technologically advanced competitors. That is how those stories usually end. “…just where did those eager cash in hand motorcyclists disappear to?” Answer: They are still waiting for someone to get it right. I was wondering why Polaris thinks that flat track racing is relevant to potential Indian buyers…? Then I remembered that Toyota pays to have something vaguely resembling a Camry driving around NASCAR ovals. That seems an even bigger stretch. Well it has a long history with it. Hopefully they release a lighter weight standard. I know harley has failed at every attempt at this and i know the biz case may not be great. But surely this would bring in new buyers and if they make it sort of true to the race bike maybe it wouldn’t alienate those that like the rest of the line up. The original Indian company that went belly up in 1953 had a glorious racing history pretty much from the first year of production until the last bikes rolled out of Springfield MA. Indian as a brand is heavily rooted in its history during this period and so paying for a racing team is one way of reconnecting the brand to its “roots” which the company relies heavily on to sell bikes. A secondary reason most likely is that their direct competitor Harley-Davidson takes part in flat-track and has since the beginning, and this is a way of embarrassing Harley or taking away “mind-share” in the cruiser community. Lastly my great desire is, having spent so much money on this new engine/frame that they will eventually branch out of the heritage-cruiser market with a more performance oriented model where the connection between it and the racing team will be more readily apparent. When is Indian going to sell the DOT version of this 750 Scout to the general public? You can watch the races live on FansChoice.TV. Replays are available. Is American Flat Track televised anywhere or available free on-line? I saw a race a couple weeks ago on tv and it is nuts, like a horse race but way more dangerous. NBCSN (NBC Sports) has been showing the entire season of singles and twins on Thursday nights. He’s posing in front of the 2018 Indian Scout Sport model, to be revealed at this year’s EICMA. Can’t wait! C’mon man…is that not the FTR750 dedicated dirt track bike? Don’t tease us! You’re talking about a “Sporty” cruiser, right? With forward pegs, 60+ inch WB, etc, right? Lol he was yanking our chains Provologna. Congrats to the Indian team and factory. Heck of a first year effort. Is HD factory even trying anymore? I haven’t watch flat track in years. I would say that they are trying. Indian snagged the best riders in the sport (debatable), run a purpose-built engine, and have a significant sponsor in Allstate Insurance. Harley moved from a purpose built engine (albeit it was > 45 years old) to a production-based motor and good riders, but without the pedigree of those Indian hired. And without the big sponsorship. I’ve been to the isle of man, watched MC in supercross, but it’s really hard to beat good flat-track / TT racing as a spectator. i saw my last race in 2013, and it was a blast. Took my daughter, and she really dug it. Yes, yanking the chain… mostly. However, notice the Indian Scout badge on the tank? Anyone with the slightest modicum of sense can tell this bike shares absolutely nothing with the current production Scout model. As Tom R mentions above, it’s a hollow marketing attempt similar to Toyota sticking a Camry label and headlight stickers on their NASCAR racer. On the other hand, the connection is valid (and brilliant) if they do a lightweight sport-y model based on the flat tracker – a legitimate connection to Indian racing history of a bygone era. Thanks to the excellent results this year they have established an ideal marketing connection to a new lightweight model. This title confirms Jared Mees is not only the best rider of his generation, but one of the greatest riders of all time. Only 2 riders, Scott Parker (9) and Chris Carr (7) have won more titles than Jared. Jared is now tied with the great Carol Resweber (4) and has won more titles than Jay Springsteen, Bubba Schobert and Ricky Graham who each had 3 titles. That’s some impressive company. And to top it off, he’s a super nice guy and a great ambassador for the sport. Nice – now how about if Indian sells a bike that isn’t cruiser? (giddy) HE WENT TO JARED!!!! i love this company, want them to do well. now give us a fun bike, lol! !